You can take advantage of prevailing winds to cool your home without using an air conditioner. Using natural ventilation is an easy way to green up your lifestyle and save money by reducing your cooling bills in the summer. The most efficient ways to move air always complement the natural ventilation scheme and never work against it. This is the key to making passive systems work; cooperation, not competition. Typically, prevailing winds come from the southwest in the summer and the northwest in the winter. Some areas have very consistent prevailing winds, but other areas experience changes almost daily. Refine your understanding of the winds in your area by keeping a log. You want to create a kind of mini wind tunnel so that the air follows its natural path, coming in through one window and blowing out the one across from it without getting sidetracked. Prevailing winds dictate the natural movement of air in your home. If all four windows are closed, you get no breeze in the house. If only one of the windows is opened, very little air movement occurs in the house. 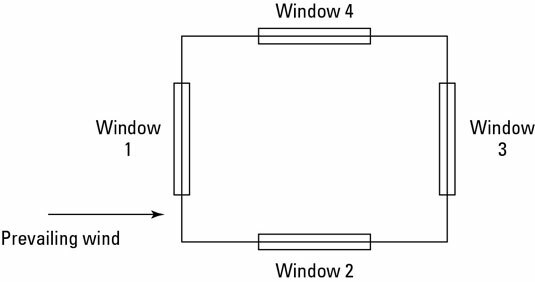 If windows 2 and 4 are opened while 1 and 3 are closed, very little air movement occurs because the two open windows are at around the same air pressure. If windows 1 and 3 are both open, a good breeze moves through the house. If all four windows are open, you get good air movement. With windows 1 and 3 open, aiming a fan out window 3 enhances the natural scheme. 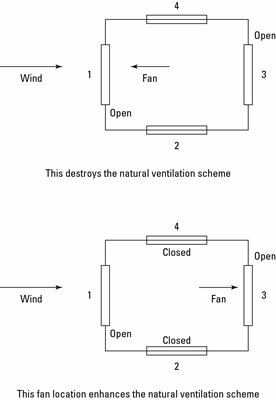 However, if you mount a window fan aiming into the house at window 3, it works directly against the natural ventilation scheme. You may end up with no air movement at all, and you draw utility power, which is about as inefficient as you can get. The prevailing winds blow toward window 1, so a fan at window 1 should blow into the room. If you set a fan in the middle of the room with windows 1 and 3 open, with the fan facing window 3, you enhance the natural scheme, but not nearly as efficiently as when the fan is right in the window. Locate fans to enhance natural ventilation.